Gene was one of the best known hockey men in Canada. He started as a junior player in the old days of the River Road Rink. Gene played for the 1909-10 City League Champs as well as the 1921-22 intermediate finalists, Gene was playing pilot of the intermediate OHA champions in 1923-24 and the following season held the same post with the OHA senior Cataracts. After his involvement in the Canadian professional circuit, Gene turned to coaching junior and senior teams. Gene was the only man to coach winning teams in junior, intermediate, and senior sections of the Ontario Hockey Association. He coached the Niagara Falls Juniors to the SPA championship in 1928-29 and the Eastern Canada finals in 1929-30. Gene was the manager of the local senior Cataracts during 1932 when they went to the Eastern Canada final. Gene brought many high calibre players to Niagara Falls, many of whom went on to the NHL. Gene also refereed amateur and professional games, including two Allan Cup finals. 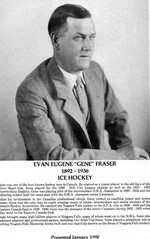 Gene played a prominent role in getting Niagara Falls Memorial Arena built and became known as the "Dean" of Niagara Falls hockey.